Car accident claims should be simple. Someone else injures you and ruins your car in a collision. Then the insurance company covers your bills and repairs your vehicle. However, a claim is a complex process, and things can and do go wrong. Learn more about the process and what you need to know. This can help ensure you get the best possible outcome after your accident. After your accident, you’ll be dealing with the other party’s insurance company (and possibly your own) to gain compensation for your injuries and damages. While the other insurance company should pay out your claims and cover your damages right away, they may be reluctant to do so. They could offer you less money than your injuries or damages warrant or even attempt to place some blame on you for the accident. Gathering information at the scene and during the immediate aftermath makes it easier for claim processing and helps prove another driver was to blame. The more documented information you have, the easier it will be to recover your losses. Also, you’ll get back on the road sooner. Photographs, contact information, and a copy of the police report are all helpful information for your car accident claim. • A police report documenting the accident. Always call the authorities, even if the damage to your vehicle seems minor. • Photos of the accident scene, including both vehicles in position if possible. • Contact information for any witnesses who saw the accident. • Medical reports from your doctor. Always head to the doctor after an accident. Some injuries to the head, back or neck are not immediately apparent but could cause long-lasting harm if left untreated. 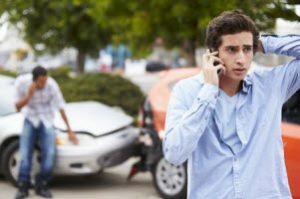 What’s Next in the Car Accident Claims Process? You’ll submit your claim to the insurance company – but here’s where things can get tricky. The insurer will offer you a settlement designed to cover your losses. Never accept a settlement without seeing an attorney first. Your accident can have long-reaching implications on your health, ability to work and financial future. A quick settlement may seem fair at the time but could end up costing you in the long run. Consulting with an attorney after your accident but before you settle with the insurance company ensures fair treatment and the best possible outcome after a collision. Schedule your complimentary consultation with Williams & Williams, LLC about your car accident claims by calling 770-823-2711 now and get on the road to recovery after an accident.